OK, look, this page is really ugly. Go to one of the blogs to see trailers. I don't know what we're going to do about this page, it'll have to be redesigned. When we have time. 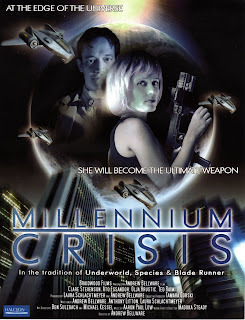 Millennium Crisis was originally named "Bloodmask". Starring Clare Stevenson and Ted Raimi, this is a sci-fi thriller which first sold to Japan. This was the last of the pictures under the "Braidwood Films" aegis. Released by The Asylum, this picture sold a little more than 10,000 units in the US. It stars Daryl Boling. The original name had been "Command and Control" but while in the shower on the morning before the first day of shooting I came up with the name "Pandora Machine". Nobody. I mean nobody liked the name but me. Click on the DVD box art to go to the official site.